This page contains general information about Kola Peninsula. For more detailed information about our cities, villages, mountain areas, Russian Lapland, history, religion, climate and weather and other information we refer to the buttons on the top of the screen. For holidays possibilities we refer to left menu of your screen. The region is covered by tundra, forest-tundra and taiga (dense forest) and is home to a wide variety of flora: more than 650 species are found here. Trees include three types of spruce, four types of birch, as well as pine, rowan, and alder. The Kola Peninsula is also rich in fauna. Wildlife includes reindeer and elk, brown bear, wolf, fox, Arctic fox, ermine, and wolverine; birds include wild geese, duck, ptarmigan, hazel-hen, grouse, eider and peregrine falcon. Various representatives of the salmon family can be found in plenty in the lakes and rivers. The "King-Fish" (pink salmon) leaps through river rapids on its journey from sea to spawning ground. The Kola Peninsula boasts more than 130,000 lakes and rivers. 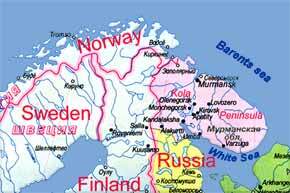 A number of mountain ranges rise out of the western and central parts of the Kola Peninsula. The largest of these is the Khibiny Tundra, possessing a maximum elevation of 1200m (Mt. Judychvumchorr). The Lovozero Tundra is made up of rounded mountains with plateau summits, the highest point being Mt. Angvundaschorr at 1127m. Both the Khibiny and the Lovozero Tundra are rich in exotic minerals. Jewel-like lakes, transparent springs, majestic waterfalls, fantastic rock outcrops and stunning mountain vistas can be found in these regions. At lower elevations, virgin forests stretch for huge distances. 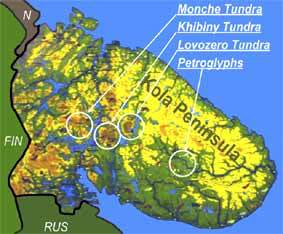 The first inhabitants of the Kola Peninsula arrived over 10,000 years ago. Remains of ancient civilisations have been found here, with the earliest finds thought to date from the Mesolithic Period. 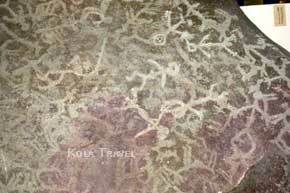 Petroglyphs were discovered on the banks of the Panoy River, one of the Peninsula’s longest rivers. These paintings are the oldest memorials of rock art among ancient peoples. For ages people continued to come to this sacred spot, and painted more and more pictures. The Petroglyphs depict the life and religious symbolism of the region’s inhabitants; however, many questions remain unanswered regarding their origin and the people who created them. Nowadays on Kola Peninsula live about one million people.